I stopped training with Mr. Douglas when I was 14 to go train at a much bigger gym in Moline, Illinois, with more technical coaches and higher level gymnasts. However, by this time the economic situation of these small, Midwestern towns, including Clinton, grew dire. Most of the town depended on Clinton Corn for work, many of whom had worked there for nearly half a century. In the mid-80s, many workers would just get cards that had “LO” inscribed on them. Countless workers were laid off this way in major sweeps. So much changed so quickly that it decimated Clinton. My parents owned an appliance store, but no one had enough money to buy anything from them. They, like many other shop owners, went out of business in this downward economic cycle. Once the store closed, my dad just lost it. He didn’t get another job for six to nine months, so my mom started working part time at JC Penny to keep her husband and three children afloat when welfare fell short. My dad wanted me to quit gymnastics then, but my mother refused. Later, she said it was because she knew it was the only thing keeping me out of trouble. But at the time, it was a major sacrifice for our family and one of the few times she stood up to my father. There was no money to drive me to Moline, so my mom would drive me to Low Moor, a town fifteen minutes away from Clinton, where I was picked up by a teammate’s mother who was getting her doctorate in nursing. She drove me the ten minutes it took to DeWitt, where we would pick up two more gymnasts and all carpool to Moline together. This process took an hour and a half each way. In the summer between my freshman and sophomore year of high school, I would wake up at 5:20 in the morning to be in Moline by 7:00. I partied a lot in high school as a means to cope, but I was still disciplined. I knew that I couldn’t train drunk or with a hangover, so I only partied on the weekends. I loved gymnastics too much to forgo my discipline. It was all I had, it was the only way to get out of my house, and it was my whole identity. Ultimately, I knew that it was my only way out of Clinton. As soon as I got to high school, I was already setting my sights on gymnastics programs around the country. The summer after my freshmen year, I went to a gymnastics camp at the University of Missouri. I was a camp counselor to pay for the tuition. This was the dream school I wanted to earn a gymnastics scholarship to attend. My father was originally from Missouri and they had one of the best gymnastics program in the country. But more importantly, they had a tall gymnast. I was an average-sized child, but I hit my growth spurt at 13 and I towered over my teammates at five feet and eight inches. I believed that the University of Missouri would take me if they accepted tall gymnasts in the past. I was just elated to be there. One afternoon, I was eating lunch next to the assistant coach to the head coach of the program and he noted with some astonishment at the amount of food I was eating. “I know. 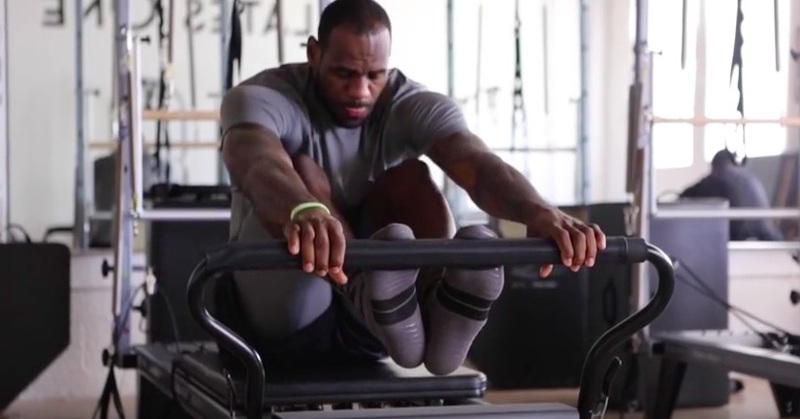 Everyone teases me about how much food I can put away, but I’m working out a lot,” I said. He asked me what I weighed and I told him I was 146 pounds. “I mean, you look good, but that number is too high.” I never forgot that haunting statement from the young assistant male coach of my dream university. Up until that point, I didn’t think much of my weight. I was more aware of my overall size and of my height, but I was all muscle. From the time I was nine years old I remember being always considered strong and muscular. One of my gymnastics teammates way back at the YMCA nicknamed me macho legs before bursting out into this Woody the Wood Pecker laugh. I was a bean pole. At that very gymnastics camp, my body fat was so low that I didn’t get my period until I was 14. Even then I only had it about three times before it went away for another six months. My sophomore year of high school I went to a slumber party. Earlier that week one of my older teammates had mentioned that to lose weight she would vomit. She explained that it was easier to vomit if you started with ketchup. She instructed us to start eating a spoonful of ketchup and throw it back up, then you could get the rest of the food you ate up. That night, we all had our turn with a spoon and the ketchup bottle in the bathroom. There was a whole collection of girls there, some gymnasts and some of our regular classmates. After that summer camp, all I could think of was losing weight. I figured that meant not eating. I would go two days without food despite working out for four hours each day. I would cave to the hunger and shovel food into my mouth. I remembered the trick with the ketchup and would purge whatever I binged. It never occurred to me whether what I was doing was healthy or not, it just wasn’t in my scope of consciousness. I didn’t even know how to eat nutritiously. My parents ate fast food five nights a week. They were both overweight and neither of them did any exercise. I didn’t know any better. To the best of my knowledge, I was taking my weight into my own hands. All I knew is that I needed to lose weight to be a better gymnast. When it came to nutrition I was just so uneducated. Instead of learning how to eat right and fuel my body I took it to the extreme and starved myself. It took me a very long time to unlearn these habits and connect with my physical sensations of hunger. I would do anything to improve myself for gymnastics even if it meant not eating. Which, of course, didn’t improve anything. I was intense. I also surrounded myself with other gymnasts and athletes that were intense. When Jacque and I were in middle school, her mom thought it would be a good idea for us to go watch the high school gymnasts compete at the State meet. They were our gymnastic club teammates for years so we were very close. This was March of 1982. Four months earlier in November of that previous year, my club teammate Karin blew out her knee with a torn ACL. She was on crutches for 12 weeks. In early 80’s reconstructive surgery for a torn ACL was not common place yet. You just didn’t have an ACL. Karin rehabilitated herself on the bars, slowly reintegrating herself into the events, but she still couldn’t vault at her highest level. Vault was her best event. When the State meet rolled around, Clinton High really needed her, but she had not done a Tsukara vault since before she blew her knee out, four months prior. For the past month she’d been competing a watered down vault that couldn’t score as well as her Tsukara. 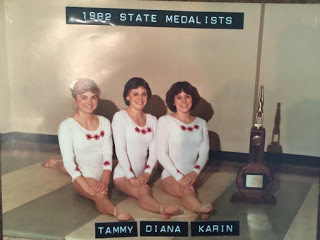 A couple of gymnasts competed and it became evident that Karin was going to need to throw her big vault, The Tsuk, if Clinton High had any chance of winning the State Championship. The coach, of course, told her not to but she wanted to do it. She was standing there and from the stands, we all heard her brother scream, “Just do it!” She stood there for a moment and you could see the look in her eyes when you knew she decided to go for it. Karin took off running from one end of the mat, hit the board, and nailed her Tsuk vault before collapsing onto the floor. Thirteen years before Kerri Strug’s vault Karin pulled this off. She’s really the original Kerri Strug in my eyes. That was our mentality as gymnasts and as athletes, sometimes you had to sacrifice yourself, your health and your body for your sport. I’m not saying it’s right, ok, or mentally sound, I’m just saying that’s what happens. I had a friend in high school who was an exceptional wrestler. Danny and I were always close, though we never dated. Danny was kind of famous in our town. He was the youngest of four boys, all of whom had been state champion wrestlers, so he was beat up on the most and became a better wrestler than all of them. He went to Greece on the junior Olympic program when he was in middle school. Even though he was able to choose his weight class, he still trained extensively. He won four state championships in high school. His high school record was 126-0 and he earned a full ride scholarship to Iowa State University, a wrestling national power house. He trained so hard that he dehydrated after one practice, cramped up and had to be taken to the hospital. He was just on a whole other mental level of dedication and body control. He could fall asleep within 60 seconds of closing his eyes. I always admired Danny and used him as a form of inspiration. Though he was on an Olympic level and I was a good gymnasts, but never pre-Olympic, I still looked up to him. I remember right before I left for college, the local paper printed an exposé on my achievements. They named my 30 state titles, conference titles, regional titles, and then it noted that I had 65 regional conference or state runner up positions. I was horrified that I had twice as many runner-up positions than I did actual titles and I was humiliated that it had been printed for all to see. That was my underlying drive, no matter how good I was, it was never good enough.